Maryanne with portrait of daughter Ariana on steps of their west-side Detroit home. 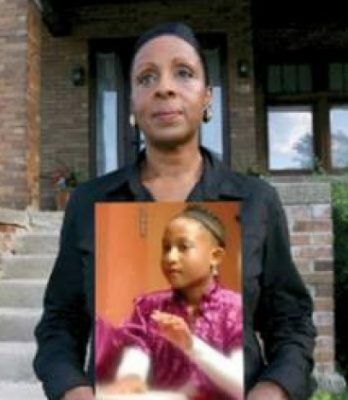 DETROIT — Global hero Maryanne Godboldo, who stood off police tanks, helicopters, and assault weapons to save her 13-year-old daughter Ariana from state seizure in 2011, suffered a massive brain aneurysm June 15. She was due in court the next day for a third criminal trial on multiple charges which 36th District Judge Ronald Giles and Third Judicial Circuit Court Judge Gregory Bill had each dismissed twice. 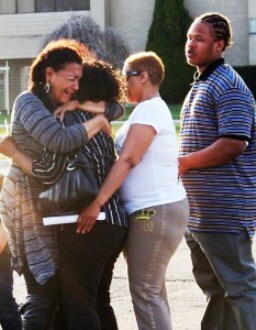 Wayne County Prosecutor Kym Worthy appealed each dismissal, frequently exceeding the time limits allowed. “I don’t want to say Maryanne was prosecuted to death, but she was overzealously prosecuted,” said her attorney Allison Folmar, who has been at her bedside almost daily along with family members. Folmar said Godboldo “nearly died” June 15, but doctors were able to stabilize her and were performing more brain surgery Sept. 7 in an effort to repair the effects of the aneurysm. Atty. 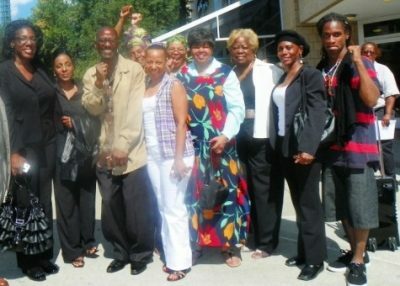 Allison Folmar is at left as (l to r) mother Maryanne Godboldo, father Mubarak Hakim, aunt Penny Godboldo and supporters celebrate first dismissal of criminal charges Aug. 29, 2011. Godboldo had been “non-responsive” for months after the brain injury, her niece Ambyr Amen-Ra said in a GoFundMe update. The Godboldo family is not well-to-do. They have established A GoFundMe site at http://justice4maryanne.com/. Tanks roll down Linwood to seize 13-year-old Ariana Godboldo-Hakim from her mother on March 24, 2011. On the night of March 24, 2011, tanks rolled down Linwood Avenue, recalling Detroit’s 1967 rebellion. Police assault vehicles and helicopters surrounded Godboldo’s modest west side home as she and her daughter remained inside, refusing to emerge for 10 hours. When several police officers tried to ram the side door down, they ended up retreating in fear of possible forcible resistance. Judges Giles and Bill later ruled that the so-called “court order” which police used to take Ariana Godboldo-Hakim, to medicate her with the dangerous drug Risperdal, was not valid. 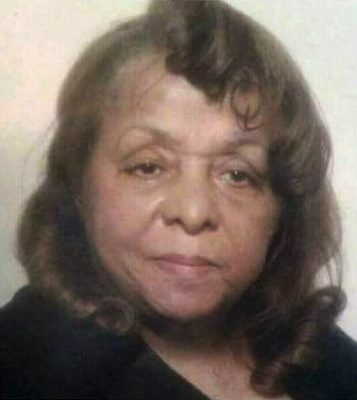 It was drawn up by Child Protective Services (CPS) worker Mia Wenk, who has no medical training, and given to a probation officer at the Wayne County Juvenile Court, who rubber-stamped the signature of the Court’s Chief Justice Leslie Kim Smith. Maryanne Godboldo weeps in arms of her friends during vigil for Ariana outside Hawthorne Children’s Hospital. There was absolutely no judicial oversight. Godboldo’s attorneys Folmar and Byron Pitts said she had every right to remain in her home with her child, and wean her off the drug under medical supervision, due to its adverse side effects. Instead, when she finally emerged with Ariana, Godboldo was arrested. Ariana was taken to Hawthorne Children’s Hospital in Northville and held for six weeks where Wenk authorized the administration of Risperdal and three other psychotropic drugs, despite the presence of the child’s father Mubarak Hakim, at Children’s Hospital of Michigan, before she was taken to Hawthorne. During her time in the hospital, Ariana’s prosthetic leg, which replaced a leg amputated at birth, was taken from her to immobilize her. Ariana had spent her childhood dancing and horse-back riding. Her mother and Aunt Penny Godboldo are both dancers. Penny Godboldo heads a dance troupe that performs at Hartford Memorial Baptist Church and teaches dance at Marygrove College. There were also allegations that Ariana had been sexually assaulted in the hospital. A judge later ordered her released from the hospital, but she has continued to suffer the traumatic effects of her seizure and forced hospitalization. Maryanne and Penny’s mother Lovey Godboldo, from obituary. Police charged Godboldo with discharge of a weapon in a dwelling, three counts of felonious assault, resisting and obstructing an officer, and a felony firearms charge. After Godboldo’s arrest, the Michigan State Supreme Court upheld the “common-law right” to resist police misconduct and false arrest, in People v. Moreno, overturning a long-used appeals court decision, People v. Ventura, that declared people had to submit to illegal police conduct. Five years of grueling hearings on the criminal charges against Godboldo, and ultimately unsuccessful efforts by CPS to remove Ariana from her parents’ custody, followed the traumatic events of March, 2011. During that time, Penny Godboldo’s husband Steve passed, and she and her siblings lost their mother Lovey Godboldo. Despite the eventual dismissal of the CPS case, Worthy relentlessly persisted in Godboldo’s criminal persecution, repeatedly appealing judge’s orders, frequently in an untimely fashion. Godboldo’s arrest and her daughter’s involuntary institutionalization elicited global outrage and support. It exposed such child seizures as common practice not only in the Wayne County Juvenile Court, but across the U.S. and much of the world. Godboldo later received a major Human Rights award from the Citizen’s Commission on Human Rights in 2012, as did her attorney Allison Folmar in 2013. Down with the Therapeutic State!